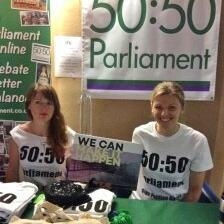 Stand Up For Women and 50:50 Parliament - Last week Radio Gorgeous went to Stand Up For Women and met Sasha Rakoff who is the founder. She wants to combine Stand Up and Comedy = Want Equality! That's their motto at Stand Up For Women. We also chatted to Frances Scott who is the woman behind 50:50 Parliament who is asking us to sign her petition for gender equality in Parliament. Frances Scott talks to Josephine about her 5050 Parliament campaign for a debate and plan for a better gender balance in Parliament. Women are 51% of the population but 23% of Parliament are male.